Quackgrass is the only grassy weed you'll find that has clasping auricles. The auricles of this weed look like tan claws that wrap around the stem. On more mature Quackgrass, the auricles can have a blood-colored tint to them. Quackgrass is one of those weeds you can't identify from the curb. You’ll need to walk up to the plant, tear off a stem and have a close look to confirm what you're looking at. The two pictures below clearly show the clasping auricles that are a telltale sign you're looking at Quackgrass. Notice how one of the auricles wraps around the stem above the other. On mature specimens, this is commonplace. Also notice how in the second pic, the auricles have a blood color to them. As Quackgrass matures, it's common for the auricles to look that way. In the two pictures above, the auricles are very pronounced as you can see. They clearly wrap around the stem. In less mature specimens however, the auricles don't always wrap that far around the stem. Quackgrass is rolled in the bud. Notice how the blades curve where they meet the stems? That's called being "rolled in the bud." Orchardgrass has wider blades than all of the grassy weeds I mention in this article except Johnsongrass. It's not uncommon for Orchardgrass blades to be over 1/2" wide on more mature specimens. The blades will tend to arch up and over like a rainbow too. Orchardgrass is folded in the bud. That means if you look at the underside of the blade, where it meets the stem, the blade will look like it's been creased, or folded instead of rounded. Look at how the blades fold around the stems on the specimens below. See how the stems look like they've been flattened? That's Orchardgrass my friend! None of the other common grassy weeds in this article have stems that look anything like that. If you're holding Orchardgrass in your hand, you'll notice that it doesn't have auricles, but ligules ARE present. Orchardgrass has small, opaque ligules where the blades meet the stems. As you can see, Orchardgrass is very easy to identify if you know what to look for. It has a very distinctive look. If you look at the stem in the center of the pic below, you can see a ligule where the blade meets the stem. See it? Nutsedge has very narrow blades that have a graceful arch to them. If you dig up Nutsedge, you'll see it has a nutlet instead of a conventional root system. Sedges have triangular stems. If you think you have Nutsedge in your lawn, tear one of the plants out of the ground and roll its stem between your fingers. You'll feel the triangular shape of the stem as you roll it if it is in fact a Sedge. Nutsedge is commonly called “Nutgrass” by homeowners, but it's not a grass. It's a Sedge. After you get familiar with Nutsedge, you'll be able to spot it from a mile away. Nutsedge will easily outgrow the turf around it, so it’s very noticable. The blades of Nutsedge have a yellowish, greasy look to them and a single groove that runs down their length. The blades almost glow in bright sunlight. If you allow Nutsedge to grow long enough in your lawn without mowing it, you'll see spiky panicles (seed heads) form on top of the plant. If you do have Nutsedge growing in your lawn, don't let it linger. A few plants will turn into a slew of them if you aren't proactive in controlling them. Know though, that June is by far the easiest time of year to control them. Have a look at the pics below. See how they have a yellow glow and greasy appearance to the blades? That’s a sure sign you’re looking at Nutsedge. The only easy way to tell Yellow and Purple Nutsedge apart is by the taper of their blade tips. As evidenced by the pic below; Yellow Nutsedge has blades that taper to a point more gradually than Purple Nutsedge blades do. See what I mean? Johnsongrass is VERY easy to identify. It has a very wide blade which is rare among grassy weeds commonly found in northern lawns, but Johnsongrass has another characteristic that makes it easily and instantly identifiable. 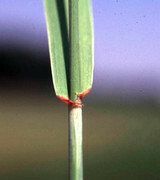 Johnsongrass has a white mid-vein that runs the length of its blades. Johnsongrass also has a bad quality that none of the other weeds I mentioned in this thread has. Johnsongrass releases a toxin into the soil that will kill any grass that tries to grow near it. If you find Johnsongrass in your lawn, get out the paintbrush and Roundup quickly! You don't want to let this weed stick around! Johnsongrass also forms huge panicles (seed heads) that are hard to miss. Have a look at the pics below and burn them into your memory. From now on, you'll know Johnsongrass when you see it. Goosegrass grows in clumps the way Tall Fescue does and the blades arch out away from the center of the plant. The most distinguishing characteristic of Goosegrass is the silver color the center of the plant has. If you’re uncertain whether you’re looking at Goosegrass, or not, look for a silver-colored center section. That’s the easiest way to ID Goosegrass. Goosegrass REALLY likes heat. That's why you find it so frequently growing out of cracks in asphalt. As you'll see in the pics below, the silver-colored center section is easy to see and a sure giveaway it's Goosegrass. When it's young (about the size of baseball, or smaller) it will have more of a tightly bunched look. When it gets some maturity to it though, it can become more leggy (not bunched so tightly). Stare at the pictures below and you'll be able to easily pick out the next Goosegrass specimen you encounter. See the silver color in the middle of the plant? That’s Goosegrass! See the silver color in the middle of the plant? That’s Goosegrass! Wild Onion (also known as Wild Garlic) has distintively dark, round, skinny blades. Of all the weeds I talk about in this article, Wild Onion is the only one you can use your nose to identify. If you think you have Wild Onion growing in your lawn, tear off a few stems of the offending weed and grind them between your fingers and smell them. If you smell onions, it’s Wild Onion. If you do have Wild Onion growing in your lawn, dig up one of them roots and all and you'll notice it doesn't have a conventional root system. Where a fibrous root system would normally be on another plant, you'll find a small onion instead. 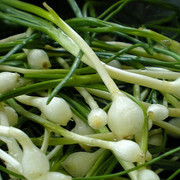 Wild Onion shoots are very slender, round and dark green in color. Their shoots grow quicker than the turf surrounding them, so they are hard to miss. Don't let these little stinkers hang around. Wild Onion isn't easy to kill, but if you know how to come at them, they WILL die. In the summer, their shoots aren't present, but they ARE present in spring and fall. That's when you should control them. Spray them in March (when they're tender) and again in October, or November. Before you spray them, be sure to step on each plant first. You have to do this to fracture the cuticle (protective waxy lcoating) each shoot has. Once you've fractured the cuticles on the shoots, herbicide will be able to easily penetrate into the plant. Follow this plan of attack and no more Wild Onion in your lawn! Well... That's it. The next time you find a grassy weed in your lawn, use these tips to ID it and you won't have to come on here and ask for help. You'll be able to glance at the weed and tell right away what it is.